A few weeks ago, I taught a canning seminar at the Northwest Flower and Garden Show and several people asked me about pickling salt. – What they could use as a substitution (if any). So in today’s mini lesson, I thought I would give you all the low down on SALT! What’s So Special About Pickling Salt? 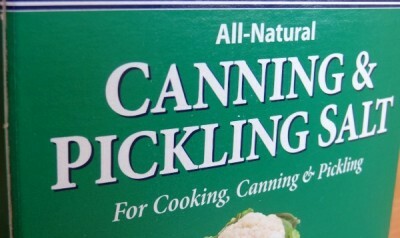 Basically, pickling salt (aka “canning salt”) is a salt that has no additives or anti-caking agents. (Common household salt does have additives.) The anti-caking agents are just there to make the salt pourable. But in pickling, those same ingredients can cause the liquid in the jar to turn cloudy! So a pickling salt is basically just pure salt that keeps your pickle brine (or any other canning liquid) crystal clear. It will not look murky or otherwise unappealing. Pickling salt is also cut as a fine grain so that it dissolves quickly in liquid. So no matter if you are making quick pickles (unfermented) or fermented pickles, pickling salt will keep the liquid clear and nice looking. 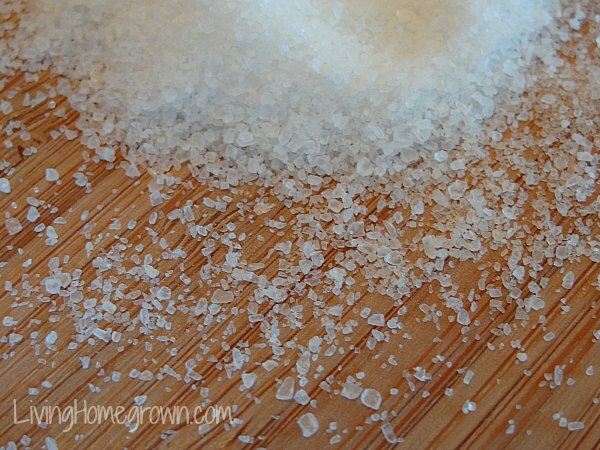 Can I Use Other Salt Instead of Pickling Salt? Yes, BUT there are some guidelines. First, you can’t always just interchange the measurements of one salt for another. The grain size is usually different and if you measure tablespoon for tablespoon, you might actually be getting a different salt concentration then is intended in the recipe. As you probably know, in fermented canning recipes the salt concentration should NEVER be altered or your may not be safe. (The salt is be there to prevent bad bacteria including botulism.) 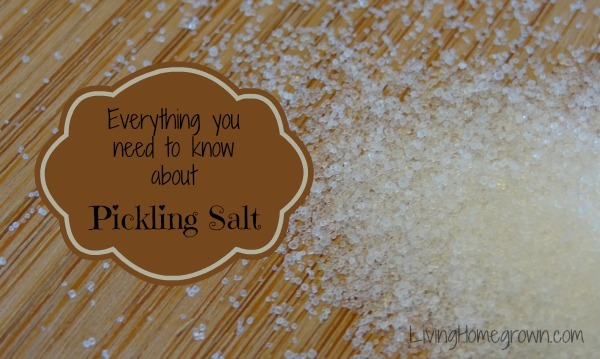 So unless you know the weight needed of the pickling salt and can weight an equal amount of an alternative, you just might be altering the concentration…and that could be dangerous. The one exception to this is kosher salt. Kosher Salt: is commonly interchanged with pickling salt because most are also pure salt with no additives or anti-caking agents. (Note: A few brands of kosher salt DO have other ingredients, so always check the label if you want a clear brine. It should only say “salt” and nothing else.) And if you can find a “fine grain” kosher salt, all the better. Kosher is the only salt I will sometimes use as a substitute if I am out of pickling salt. The grains are not exactly the same size, but kosher salt generally weighs about the same as pickling salt. They just measure out differently by volume than pickling salt. For that reason, it is not recommended that you substitute other salt in canning recipes unless you can use a weight measurement instead of volume. If you can measure by weight, then either of these salts would be fine. The bottom line is that if you can get pickling salt, buy it! It is available anywhere that canning supplies are sold and is also available in cooking stores and even online. It is by far the best salt for canning. Remember, most recipes that are calling out salt as an ingredient are proportioned for pickling salt. It is always best to use that as choice #1 and kosher salt as choice #2. Here in Los Angeles, I can only find pickling salt at a limited number of stores – So I sometimes buy it online. How about you? Are you able to find pickling or canning salt locally in your neighborhood? Thanks Theresa, I had no idea that salt made any difference! You just saved me time and possibly agony. I love reading your articles, they’re so helpful. Does canning salt have a shelf life ? What is a Tablespoon of sea salt converted into pickling salt. I’ve got a sauerkraut recipe that calls for sea salt and I want to use pickling salt. Please help me convert it!! Thank you!! i enjoyed reading your article on sale. thank you! can you recommend a recipe to ferment vegetable with salt. my mother use to put all kind of fresh vegetable and cucumbers hot water and salt. i like to do that but i am not sure. is this possible? Can you just grind/pulse sea salt, flake sale, or Kosher salt to get the same fine grain and measuring equivalents? I used to think that all Kosher salt was pure. But no, as you note. Diamond Crystals has no anti-caking, Morton’s does. I noted this when deciding to corn my own beef for St. P’s day, having only Kosher salt on hand. I normally use Diamond, but had Morton’s on hand, and double checked the label. Anti-caking! I ended up buying canning/pickling salt which was readily available at my local Food Lion. It is also worth noting that for brines that weight of ingredients (v. volume) provides best results due to the volume/weight differentials due to crystal size as you note. (Same is true for weighing flours when baking–which saves time and improves accuracy). Great Johnny. Glad you found the post helpful. What about Himalayan Sea Salt?